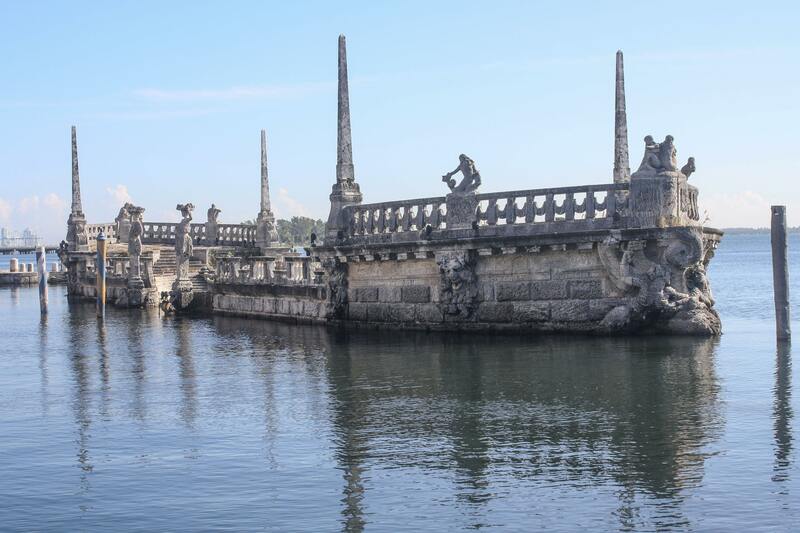 Vizcaya’s most curious feature is the fantastical breaker in the abutting Biscayne Bay. One of the models in the ivory dress with a long feathered train looked exceptionally bored, regardless of whether the camera was rolling. I didn’t know if her ennui was part of the persona she was trying to adopt or not, but I found it hard to believe that anyone could be so disconnected from the grandeur all around. I was standing on one of the terraces at Vizcaya, a 34-room Italian Renaissance villa on the shore of Biscayne Bay in the Coconut Grove area of Miami. Built by James Deering between 1914 and 1922 as his winter residence, Vizcaya still stands as a genteel oasis in the midst of a subtropical forest just minutes from Miami’s modern and sparkling skyline. Conceived as a modern interpretation of an 18th-century Italian villa, Vizcaya’s designers employed traditional Mediterranean architectural elements and tweaked them for the local climate. Deering envisioned his home being approached by boat, so it’s the bayside façade that received the grandest details, including the terrace where the photo shoot was now wrapping up. A breaker just a few feet out into the water was constructed like a wrecked classical barge cluttered with statues, a vessel of the Greek gods dashed against the Floridian coast. It’s the perfect spot to begin an exploration of the estate’s 50 acres among native rockland hammock trees. The gardens are embellished by water features and a host of classical sculptures. Unexpected little surprises greeted me throughout the grounds, starting with the waterfront gazebo. Multiple gardens host pools, waterfalls, grottoes, a maze garden, and a fountain garden. A tea house, reached via a little arched bridged, suggests a life of leisure, and a “casino” building houses a beautiful ceiling mural. The statuary walks boast unspoiled views of the house and the enclosed loggias on the two stories. After I circumnavigated the building, I stepped inside for a closer look at how Deering lived. A central courtyard, originally open to the sky, is the heart of Vizcaya, with loggias leading from room to room framing it on all four sides. The first floor was given to the estate’s public areas — arcades and loggias, reception rooms with marble floors, a library, and a dining room, all furnished with recherché objects Deering acquired from Italy. The walls in the over-the-top music room are paneled with paintings framed with gilded wood moldings. Illuminated by an ornate Venetian chandelier, the room contains a gilded zither, a harp, and a 17th-century Italian spinet. 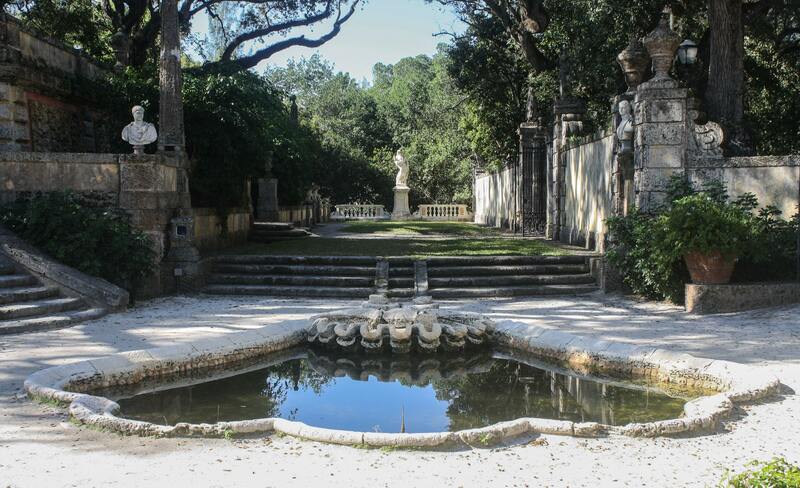 After exploring the gardens, enter Vizcaya and explore its three dozen rooms. More private areas occupy the second floor, including several bedrooms and a breakfast room that rivaled the size of my entire apartment and that contains four corner chandeliers rather than a central one. Deering’s regal bathroom has a tented ceiling draped in embroidered linen. 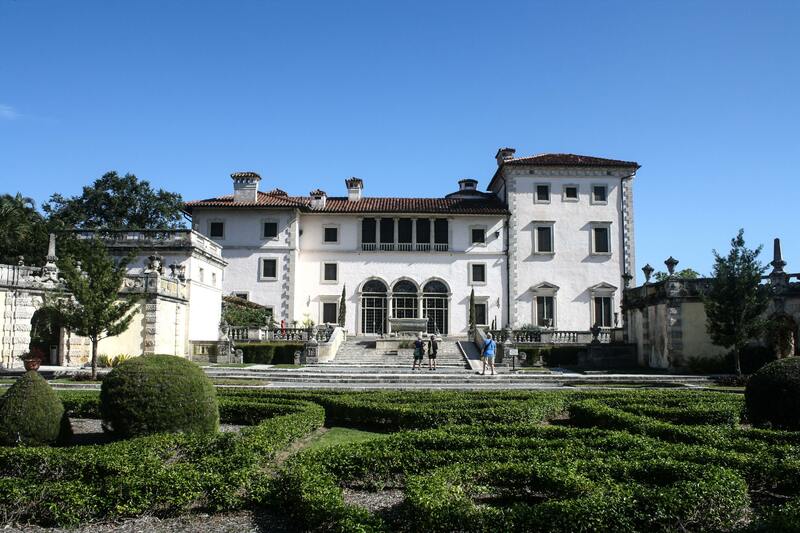 Despite its age, Vizcaya was a very modern edifice for its time, boasting a water filtration system, generators, heating and ventilation systems, a central vacuum-cleaning system, a dumbwaiter, a couple of elevators, and a partially automated laundry room. By the time I returned to the terrace, the impassive models had disappeared, perhaps in search of a filling lunch of watercress and a mint, and I was left alone to enjoy the multi-million-dollar legacy of one man’s efficacious desire to achieve extravagant comfort in a jungle.